Leaves of grass, grains of sand. Our next workshop is over the Easter weekend, a time symbolic of rejuvenation, of adjusting one’s perception to the minutiae. The rocks and the forest shelter tiny worlds enabled by orientation and position in relation to prevailing wind, rain and sunshine. In this workshop we’ll focus on the small scale discoveries to be made at Haneena Hill: Rock holes eroded by the elements in which richly varied landscapes unfold within a space the size of a human hand, lichen nestling among tree roots presenting in a tiny scale the forms of the high forest foliage. The Autumn air on the granite high country thrills the senses enabling a profound sense of time and place. For workshop Itinerary information look here. Further enquiries and to book your place in this workshop here. Posted on March 25, 2019 Categories UncategorizedLeave a comment on Leaves of grass, grains of sand. The artists who participated in the Summer Cool workshop brought a considerable skill base and quality of aesthetic decisions to bear in the presence of the natural environment of Haneena Hill. Necessarily these encounters are improvisations as the sites are complex interactive ecologies. we arrive at a forest textured with stringy bark, the geometry of cypress and scribbled lines of angophra, interlace with large fallen timber glowing surfaces of red and yellow fungus. A stone ledge or entire granite hillside, a group of ancient lichen covered boulders giving pause to reflect on the formative geological processes in deep time, their volumes misted by acacia and melaleuca foliage. Each workshop here has a freshness in the encounter between the complex natural landscape and the artist whose own complexities are encouraged into the spaces between two natures. The outdoor art making and interior living, meals and conversation combine for a successful weekend. Nameer is back from Africa with a drawing process developed in his travels through Tanzania’s Usambara mountains, the Serengetti Plains, Lake Tanganyika and Zanzibar. In the last month he was immersed in a social drawing project in Lagos, Nigeria. The sweltering equatorial climate drew him to certain ways of addressing subject matter in his drawing – tonal and textural choices in the patterning of surface and development of spatial structure. Now for this summer workshop we take temperature as a serious consideration in developing the means of painting, cool to warm colour choices, the scale and texture of surface pattern and how they serve to develop a physical climate within the painting. Barbara is developing a menu for the weekend that reflects the theme of temperature and climate, her provisions are a major part of the weekend experience. There are limited places available for this workshop, please use the contact page to show your interest in joining us for this first workshop of 2019. Arrive late afternoon / early evening – Dinner and get to know each other. Introduction to the place and the ideas to be developed over the weekend. 9.30 – 12.30 Tutored workshop in the environment with Nameer. Workshop numbers are limited to six people. For future workshop dates and themes please subscribe to this website for workshop updates. Workshop numbers are limited to six people. For future workshop dates and themes please subscribe to this website for further notice. Accomodation is in a spacious heritage residence with wood heater and dormitory style sleeping arrangements. We limit the weekend to a group of six, please register your interest via the contact page in the dropdown menu. Our August workshop proved to us why we are committed to creative encounters at Haneena Hill. Responsive and enthusiastic, the artists who attended the workshop revealed delicate aspects of the quietly spectacular landscape in their work. Please check the previous post for details of the weekend workshop schedule. Nameer is away soon to develop some work in two quite different residencies. In October he’ll be in Tanzania joining up with the Nafasi Art Space in Dar Es Salaam at the beginning and end of a drawing tour of the country with workshop and small exhibition planned. For the month of November, in Nigeria he has been invited to participate in the 2018 Lagos International Contemporary Art Festival, developing a project with youth at a local school. Barbara is part way through some public art projects in Brisbane and, with a new kiln plans to develop her ceramics in the coming months. The upcoming workshop on the 10th to the 12th August explores colour as a sensation spread between pigment, texture and opacity. The focus on colour in this multifaceted way comes out of the experience of being in the landscape amongst the texture, pattern and pigment of rock, lichen and foliage; and within the tonal mists and fragrances of the forest and the highland air. The ancient Greek idea of colour collected a variety of qualities related to the senses and the experience of the world. Instead of colour as a spectrum they saw colour as embedded in things. For example tree-coloured or stone-coloured; these surfaces were referenced to touch, smell, solidity and saturation. The ideas we’ll develop in this weekend workshop provide fuel for the artist’s practice in both an abstract and realist way as we freshen our responses to the very rich environment of Haneena Hill. Please search Reviews in the dropdown menu for commentary by participants in the previous workshop. 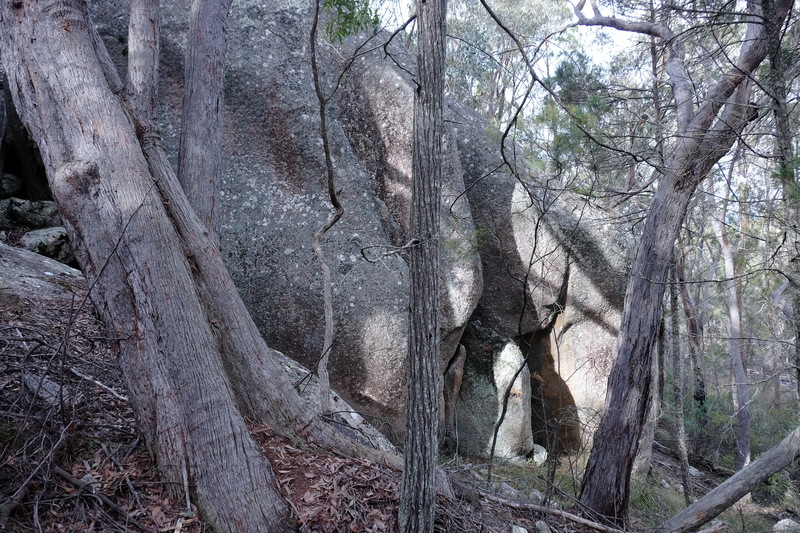 The workshop day began with an early morning immersive walk through the forest and over the granite escarpment. Here, the geometric moss-green spires of cypress pines within a grey and white tangle of Angophra and stringy bark, and there, the weathered waves of grey granite dissolving in the light and brought into visual focus by textures of lichen, algae and moss. You’re not looking at this landscape so much as looking into it; there are fewer opportunities for the picturesque than for imaginative reflection. With a tangle of lines like an improvised Chinese ice crystal screen, leading the eye through space with the promise of an emerging shape, an object of some kind is suggested before turning vision in on itself. A connection between physical movement and visual experience brings thoughts of the Provence landscape’s influence on Cezanne. His invention of an angular geometry, listing lines suggesting visual perspective and physical movement, as if the human body, tossed in the winds of a highland landscape has only a cosmic scale of gravity to orient itself. The house worked well to accommodate everyone and Barbara’s kitchen production fed the appetites brought on by the intensive painting and drawing en plein air. Some good Shiraz and Pinot Gris from the nearby Casley Mount Hutton vineyards were a great discovery. We’re excited about the upcoming June workshop with a group of six creative and enthusiastic artists. As the workshop filled quickly we’re encouraged to offer the next one from the 10th to the 12th of August. Details of the workshop will be posted in early July when we can also share outcomes from the upcoming High Time weekend. Please follow us if you’d like to receive updates.